A good opener that is intriguing, has a huge visual impact, quick, easy, and can be performed regardless of the size or the style of the show is not always easy to come by. 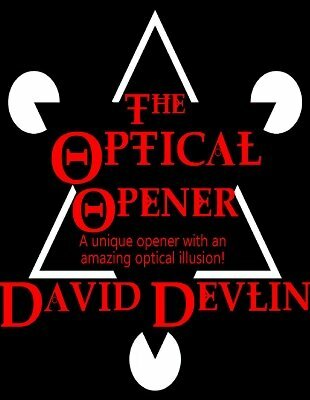 The Optical Opener from David Devlin fits all of those conditions. It is an opener that requires no technical skills, is visually mystifying, entertaining, and will have even you saying, "Whoa! That is so cool!" This routine employs an optical illusion that creates a photo that visually changes as it is turned over. David has created not one, but nine different illusion photos that you can use to perform this routine. These photos can be printed to different sizes and can even be placed on your electronic device so you can perform this illusion impromptu. This is a great opening effect for adults, kids, close up shows, stage shows, and because the illusion works due to how the human brain processes visual information it is beyond perfect for mentalists. Here is the routine: On the stage is a large picture of a famous celebrity (David generally uses a picture of the late Robin Williams). The performer is introduced and walks over to the picture. He discusses who the picture is of and why he is famous. He says that there is a little secret habit that he had that very few people know about, and that he (the performer) is going to let the audience in on the secret. The secret is that he loved to make himself dizzy. He would make himself dizzy by standing on his head for a few moments and then would turn back to right side up. When the performer says that he would stand on his head, he turns the picture around to show the audience the same picture, but upside down. The celebrity appears absolutely normal except that the picture is now inverted. When the performer says that he turns himself back to right side up, he slowly revolves the picture 180 degrees. As he does the face of the celebrity slowly and visibly contorts into a freakishly twisted state (looking "dizzy"). The performer can then turn the picture around again to show the normal photo, and can go on to explain why this optical illusion fools our brains. Yes, the performer can explain how this illusion works without exposing any real magic secrets. You will be performing this every chance you get...probably several times per day. This is a great opener for any show. I will be using this to open my mentalism shows. I can see this getting a great reaction from the audience. Not just a gag but a real fooler.